The live org chart lets salespeople maintain external organization charts for their accounts. Dynamics 365 for Sales users can build a hierarchy for existing accounts or use it as a starting point for adding contacts to a new account. The org chart also provides easy access to an embedded LinkedIn Sales Navigator widget, helping to ensure that contacts are kept up to date. 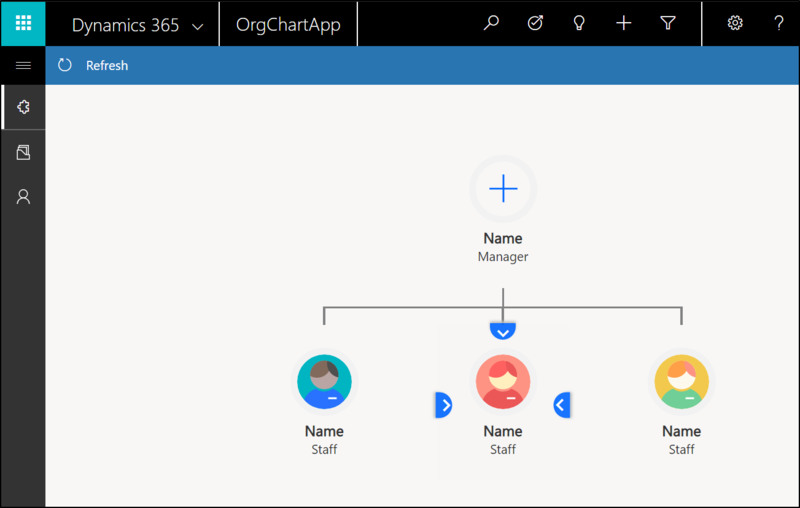 When using the org chart, the hierarchy settings will be auto-enabled if they weren't enabled before. A relationship with schema name contact_parent_contact will be created with the parent attribute schema name parent_contactid. If you wish to use a different relationship for the org chart, please contact your admin to create a new hierarchical relationship. The org chart is accessible from the account form. 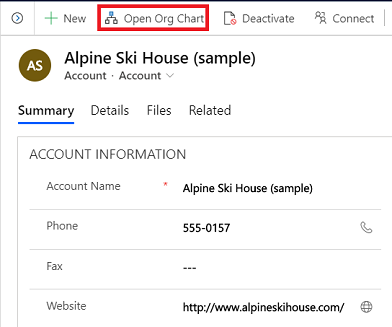 Select Open Org Chart from the command bar to open the org chart for the account. When entering the org chart for a new account with no contacts, a placeholder org chart will be presented. The contacts are placeholders, representing a manager and direct reports which can be added to the chart. Double-click the manager node which is represented with a ‘plus’ icon. 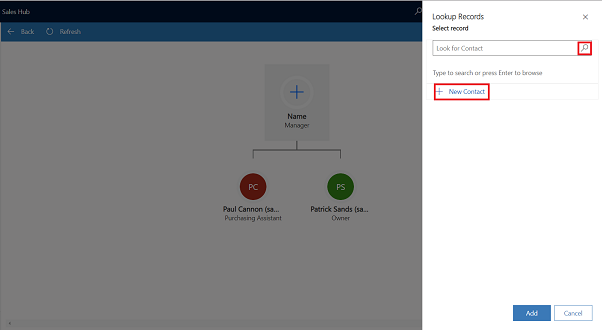 This will open a Lookup Records side panel where you can search for contacts, or quickly create a new one. The search for contacts will return results for contacts which are currently not associated with another account to avoid disrupting another hierarchy. All contact searches behave in this manner. To create a new contact, select New and enter the contact details in the quick create form. In the Lookup Records side panel, select Add. After the contact is saved, the org chart will show the contact which is now associated with the account with their full name and their job title. Double-click the the contact to add more contacts to the chart or edit the contact details. A contact can only have a single manager but may have many direct reports. If you have a Sales Navigator seat, LinkedIn profiles are always just a few clicks away and can be used to ensure contact details remain up to date. Sign in to the service by selecting the Sales Navigator button. You’ll then be presented with the embedded LinkedIn Sales Navigator widget, where you can match the contact and see their LinkedIn profile. If an organization has no hierarchy associated with the contacts, then the contacts will all be on the same level and report to a placeholder contact. You can edit the contact details to manage the hierarchy. Select and drag any contact on the org chart. When a contact is dragged over to another contact, it becomes a direct report of the contact that it was dragged to. When contacts are dragged and dropped, their direct reports move with them. When you finish arranging the contacts, select the Save button in the the command bar. When you hover over a contact, you'll find arrows to expand and collapse the hierarchy of a contact. Select the arrows to show or hide peers or reports of a contact. Use the mouse wheel to zoom the org chart in and out. By clicking and dragging on the canvas you can pan across the org chart. For larger organizations, this makes navigating the org chart much easier. To remove a contact from the org chart, select it and select the Remove button from the command bar. This will remove the contact from the org chart, but it will not delete the contact, just the association the contact has with the account. When a contact is removed, the direct reports (if available) of that contact will move to the level of the deleted contact.